It is always quiet evenings when disaster strikes and so it was on Monday April 14 1947 when the liner Queen Elizabeth ran aground. In the days before rapid transatlantic flights, The Royal Mail Ship (RMS) Queen Elizabeth operated a weekly luxury liner service between Southampton and New York. A phone call, to the Southampton ferry and tug company Red Funnel, started a huge and challenging recovery exercise to refloat the 83,000 ton liner from the Bramble Bank. Tugs Canute, Clausentum, Neptune and Vulcan and Alexandra Towing Company’s Romey, Hornby and Poulsom were sent but soon it was realised more would be needed. Last week down memory lane featured the Royal Navy tug HMRT Bustler, a model of which is in Campbeltown museum. The powerful vessel, with many Campbeltonian crew, had a role in the recovery of Queen Elizabeth. 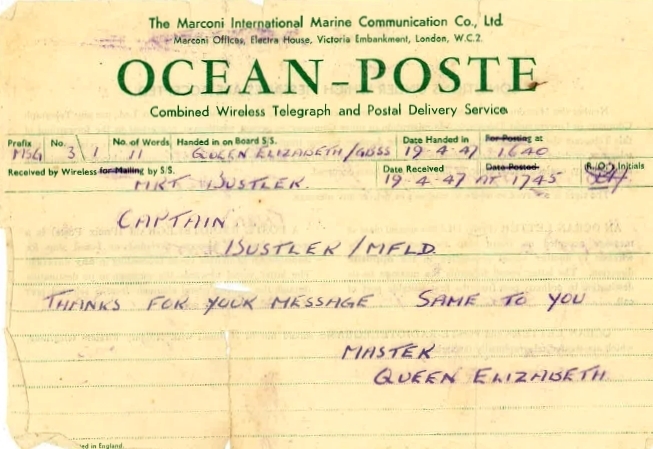 On April 19 1947, a telegram was sent by the master of the Queen Elizabeth to the tug captain, Lieutenant Commander Archie Leckie, on board HMRT Bustler and his help was requested.